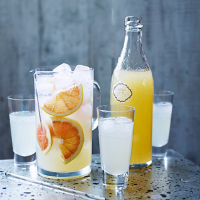 This spicy, citrussy syrup perks up a soda water refresher and works well with ginger ale. 1. In a pan, heat the sugar, ginger and lemongrass with 600ml water, stirring well, until the sugar has dissolved. Bring to the boil and bubble for a couple of minutes, stirring, until slightly syrupy. 2. Pour the grapefruit juice into the ginger and lemongrass syrup, stir well, then set aside to cool completely. 3. Strain the cooled mixture theough a sieve lined with muslin, collecting the cordial in a jug. Discard the grated ginger and the lemongrass stalks. Transfer the cordial to sterilised bottles using a funnel, then seal. Can be stored in the fridge for up to 3 weeks.